Looking for the perfect gift for your beverage-sipping Portland sports fan friend? Well shoot, these aren't for sale. But if they were, they'd be perfect... if not a little pricey. We printed the Timbers side with two inks on 300g Fluorescent White Lettra. On the opposite side, we printed a modified Trail Blazers logo with silver and red inks on ridiculously thick 4-ply rich black museum board. Then we duplexed the two sheets by hand and die cut them to 4 inch 80pt thick circles. Silver is one of the few letterpress inks that's opaque; most non-metallics are transparent. So we printed the full Blazer logo in silver to create a light-colored base, then printed red ink on top of the silver for half of the logo. If we'd just printed red on black, the color would be completely lost. 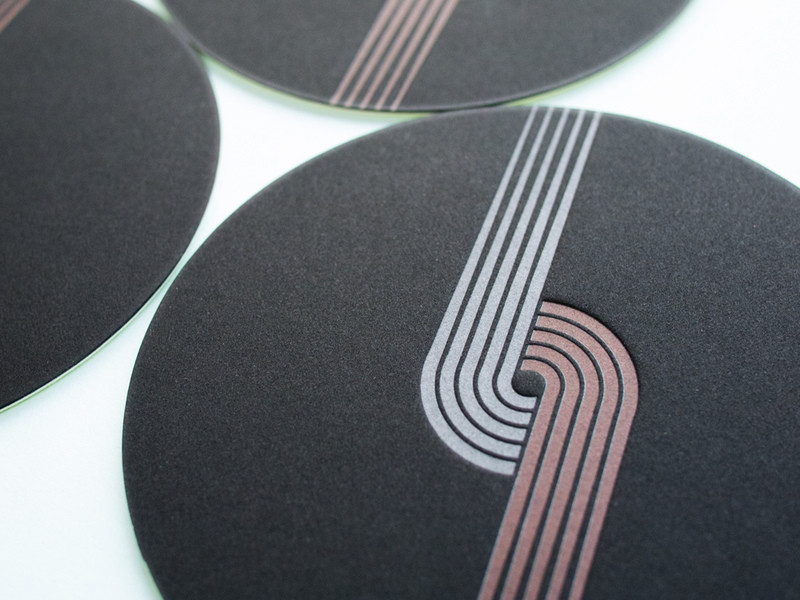 Posted in coasters and tagged with coasters, portland, black, fluorescent white, duplex, silver, trail blazers, timbers, die cut, sports. February 18, 2015 by Travis Friedrich.